Welcome to Classical Fake Books. Classical Vocal Music – piano accompaniment simplified. Want to teach or learn opera arias or Lieder but don’t have good enough Piano skills to read the accompaniment fluently? These books will help you play along and support your pupil or yourself whilst singing. 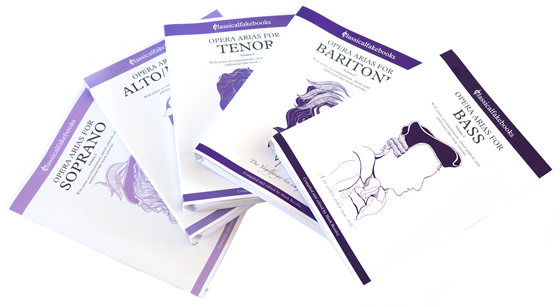 There are 5 books of opera arias to choose from; Soprano, Mezzo, Tenor, Baritone and Bass. Click on the voice type that interests you to see what is in each book of opera arias. In addition there are two Schubert song cycles available, Schwanengesang, and Winterreise, each in 4 volumes with High, Medium, Low and Very low keys. More titles are in development. They are a vital tool for teachers and students who struggle to play difficult orchestral piano reductions often used in the vocal scores of opera arias. Each Aria book contains a carefully chosen selection of opera arias. Some are essential exam arias, others are popular repertoire arias, and there are some more advanced arias to stretch you. The Lieder books contain a new feature – a word for word translation of the text into English actually IN the score – no excuses for your students not knowing what they are singing about any more! A prose translation is provided at the bottom of each page as appropriate. Take a look at the books in the shop. If you have any questions about the book contact us through our facebook page or chat with us by clicking on the chat icon. Have a look at our sample Fake Books and see how useful they are. View Samples. Visit our shop to see what titles we have on offer. Have questions or can’t find what you are looking for?